Gain harvesting is a great year-end strategy that could potentially save the taxpayer substantial amounts of capital gains tax. The strategy applies to taxpayers who expect to be in a higher tax bracket in the future than in the current year. If this is the case, the taxpayer will sell the assets this year, pay tax on the gains at the lower current tax rate and step-up the basis of the assets to the sale price. Then the taxpayer will reinvest the funds and sell whenever he otherwise would have if the gain harvesting strategy had not been used. By doing so, the taxpayer shifts recognition of part of the capital gain from the higher bracket future tax year to the lower bracket current tax year. What if you had an easy-to-use tool to help you determine for your clients whether or not the capital gains harvesting strategy makes sense? What if this tool also provided you simple to follow charts and a resource to be able to show and explain this concept to your clients? The Gain Harvesting Strategy that explains how harvesting gains can generate huge return on investments, the net investment income tax (commonly known as the Medicare Surtax), the current capital gains rates and how the recently codified Economic Substance doctrine might apply to the strategy. This is provided in an 8-page PDF file and will provide you the in-depth explanation of the gain harvesting strategy so that you will better understand the technical aspects of this strategy, making it easier to explain to your clients and referral sources. 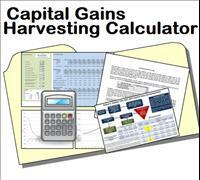 BONUS: The 2013 Capital Gains Harvesting Chart that summarizes the Harvesting Capital Gains concept, with a decisional flowchart, an outline of the applicable tax brackets and thresholds, five different capital gain harvesting scenarios and a capital gain harvesting return on investment chart. This chart is 11″x17″ and comes in a printable PDF format so that you can print multiple copies for your clients and referral sources. You get all of this in an immediate downloadable zip file so you don’t have to wait for your order or pay for any shipping or handling!